CORREGIDOR ISLAND is long before in my bucket list here in the Philippines. When I and my best friend booked our Miss Universe 2017 tickets, we thought of making this island as our side trip since I have one whole day to spare in Manila. This was one of the best decisions we have made. 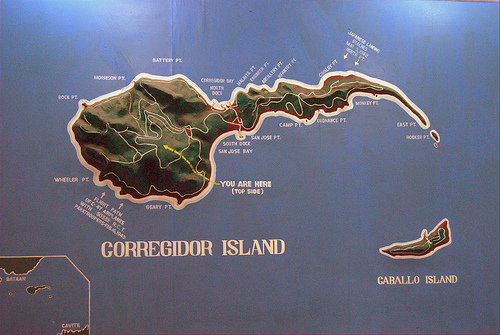 Corregidor Island is part of the Province of Cavite and is situated 48 kilometers West of Manila Bay. This tadpole-shape island fortress stands a living proof of the heroism and courage of all Filipino-American soldiers who defended the Philippines from the Japanese invaders during World War II. After some thorough research of the place, we stumbled upon Sun Cruises Philippines Website. (Visit their website HERE). Sun Cruises Incorporated (SCI) is the only trusted Tour operator for Corregidor Island. They provide Tours, Ferry Services and Hotels in Corregidor island itself. Monopolized as it may sound but all tours in the island must be guided and regulated. Upon browsing their website, we decided to take the Island Day Tour with Buffet Lunch. You can visit their website HERE for more details. The rates published are as of 2016. We paid P2,550.00 and settled it ahead via Credit Card and through their Website. The good thing is that the package includes Buffet Lunch already. After payment, Reference Number and Special instructions will be sent to you. Jump-off point for the Sun Cruises Inc. Terminal is located at the Mall of Asia Esplanade Seaside Terminal Pasay City. We arrived there before 7AM as advised. Upon arriving at the Terminal, just look for the Corregidor Island Section and fall in line. Present your ticket or receipt along with your Valid ID. Once settled, pay the Terminal Fee of P30.00 prior going to the gate. You will issued with stickers. Your Bus number is indicated in your sticker. I must say that I am impressed with the service of Sun Cruises Inc. from ticketing down to the Ferry ride itself which is still under the same company – Magsaysay Shipping Lines. The Ferry is comfortable. Seat is a bit small but I had a good ride. Travel time from Manila Bay to the island is approximately 1 hour & 20 minutes. You can somehow feel the waves especially when approaching Corregidor. Upon arrival at the island, you must head directly to your assigned tram buses stated on your respective stickers. Each tram bus has one assigned Tour guide. I must say that I am impressed. Loved how organized our tour is especially riding this classy tram buses with well-trained tourist guides who acted as story-tellers too during the whole trip. I was just amazed to rediscover Philippine history with our Day tour. It feels so surreal. From history books to reality feels. The island is also know “The Rock”. It became the headquarters of the Allied Forces and also the seat of the Philippine Commonwealth Government under President Manuel Quezon. During the Japanese Invasion on December 9141, the military force under General Douglas MacArthur carried out a delaying action at Bataan. In 1942, MacArthur went to Australia and left Lt. Gen. Jonathan Wainright in command. On this day, the famous MacArthur line ” I shall return” was popularized and became part of history. The Filipinos Heroes Memorial is the site that commemorates the valor and heroism of all Filipinos who fought for their lives to secure both Corregidor Island and Manila. The fall of Bataan on April 9, 1942 did not stop General MacArthur and his Allied Forces to reclaim Corregidor in March 1945. From then on, the big guns in the island and the ruins of buildings and structures devastated by years of war and violence stood by as a testament of heroism and courage that has claimed so many lives. One of the major spot in the island is the Malinta Tunnel experience. This is not included in the package so we have to pay additional P200.00 to get inside. The construction of the tunnel took about 10 years. It was completed in 1932. The 835 feet long East-West passage served as the main tunnel which is 24 feet wide and the height at the top of its arch is 18 feet. The tunnel had been dug through solid rock and offered complete protection from artillery or air attack. Command communications and medical units were located there. Gen. MacArthur set up the headquarters inside the tunnel where men and women would live and work during the siege of Corregidor. The Malina Tunnel Experience is a 30-minute walk-in tour inside with several stops for videos narrating the background of the tunnel. It is written and directed by National Artist, Lamberto V. Avellana. Corregidor Island is truly a historic place for the Philippines and even the Americans as well. Aside from ruins and guns, the island also house the Pacific War Memorial Museum in honor of the Filipino-American soldiers who served during the Pacific War in World War II. This was funded by the American Congress and showcases war artifacts and relics. I am really impressed with Corregidor Island. Aside from its rich cultural background, the place is really well-maintained and preserved over the years. No doubt they wanted to monopolized everything for the spots to be regulated. What I love about the island is its reforestation projects. It feels like you are not in the Philippines at times. The tour was even made more exciting with our bubbly tour guide (Shocks forgot his name). The lunch was also good though I haven’t took picture since I am so hungry at the moment. After the trip, I must say that Sun Cruises Inc. exceeded my expectations in terms of service. The island is worth coming back. ***Hope you find my blog worth-reading. For more features, like MC on Facebook. Previous Post Horrifying. Disturbing. Riveting. Hacksaw Ridge delivers to be one of its genre’s best. Next Post Predictable & disturbing. Friend Request manage to deliver despite its flaws.